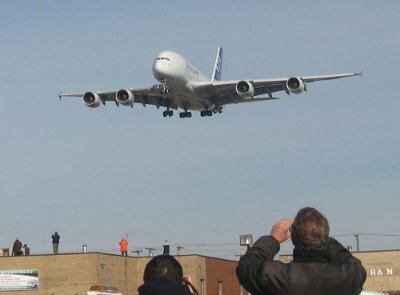 The impressive Airbus A380-800 landed in Montreal for the first time on November 12, 2007. I was there on Highway 13 to see it come, along with thousands of other planespotters. It was an aircraft sporting an Airbus color scheme, carrying reporters and dignitaries as part of the A380 world tour. It circled over downtown Montreal, and then it made a smooth landing. On October 7, 2010, history repeated itself. Only this time, it was a revenue flight, to celebrate the 60th anniversary of Air France’s presence in Canada. The weather was dreadful this morning, but the sky cleared up a little… just in time for the 5:40 PM arrival of Air France flight AF346 from Paris. No downtown circling this time, but a straight-in approach, probably because of a delay on departure from Charles de Gaulle Airport… and the fact that the plane had a two-hour turnaround time. Regrettably, unlike 2007, I wasn’t there. I noticed the flight was delayed and, as I finished working downtown, I tried to make the metro station closest to the airport. By the time I got there, the flight was already on the ground getting its water cannon salute. But it’s quite alright. I was there in 2007 and those memories will stay with me for a long time. And thanks to the great online aviation community in Montreal, there are already tons of pictures of the A380 arrival posted, and even a video of the landing (and more by the time you read this). The media was also there to cover the event. The biggest surprise, for me, was Air France’s announcement of a daily A380 Paris-Montreal flight, starting May 9, 2011. There were rumors about it, but I didn’t really make much of it. Now, it’s official! So, I guess I’ll have another chance of seeing that super jumbo operating from Montreal… Just not this year. UPDATE (Apr. 25, 2011): Air France actually started its daily A380 service to Montreal (flights AF346/347) on April 22, 2011.